New Delhi July 13 (IANS) The National Health Agency (NHA) on Friday said it has launched a pilot for the Beneficiary Identification System (BIS) for confirmation of 10.74 crore poor and vulnerable families eligible for health coverage under Ayushman Bharat or Modicare. "Measures like identity validation through a mechanism like BIS will make Ayushman Bharat more accessible and transparent in approach. 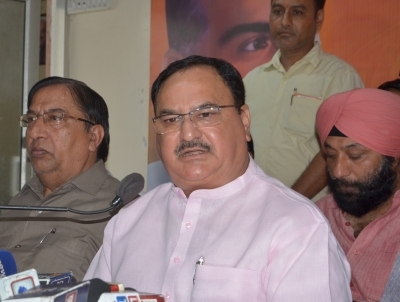 BIS will ensure that no entitled beneficiary will be deprived of his/her entitlement under the flagship mission " Health Minister J.P. Nadda said. The BIS will apply the identification criteria as per the guidelines of Ayushman Bharat -- National Health Protection Mission (AB-NHPM) on Socio-Economic Caste Census (SECC) and Rashtriya Swasthya Bima Yojana (RSBY) database to confirm the beneficiaries. "Ayushman Bharat will target about 10.74 crore poor deprived rural families and identified occupational category of urban workers families as per the latest SECC data both rural and urban. Additionally all such enrolled families under RSBY that do not feature in the targeted groups as per SECC data will be included as well " the NHA said in an official release. The BIS pilot drive was initiated at Sonipat Haryana. The objectives of the pilot were to test the BIS application in both rural and urban settings and to be able to match the SECC beneficiaries with the application search result the release said. "The families were also covered in the Additional Data Collection Drive (ADCD) individuals were advised to bring both their ration cards voter ID card Aadhaar card or any other government prescribed identity " the NHA said. A second pilot was conducted after incorporating learnings from the pilot at Dadri Uttar Pradesh. To make the BIS more robust and user friendly more pilots are planned at Chhattisgarh and Jharkhand. "Validation of entitled beneficiary through BIS will ensure timely information up to the last mile facilitating benefits under Ayushman Bharat. There will be different types of users at national state and district levels to facilitate the process like Ayushman Mitras Common Service Centres Kiosk Operators Insurance/Third-Party Administrator " Ayushman Bharat Mission CEO Indu Bhushan said.